Description: New laptop ac power adapter charger. 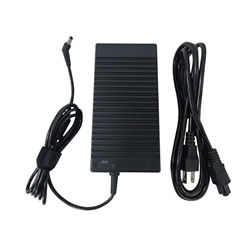 This high quality aftermarket adapter comes with a power cord and is 180 watts. Asus ROG G701, GL502, GL552, GL702, GL752. Asus G53SW, G53SX, G55VW, G75VW, G75VX, N56VZ, N73SM, N76VZ. **There is more than one version of adapters for the models listed. This adapter has a 5.5mm x 2.5mm tip. Please check the tip size of your existing adapter before ordering.